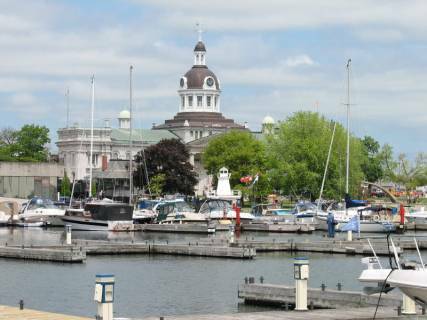 Picton, Ontario, Bay of Quinte. May 24, 2006. 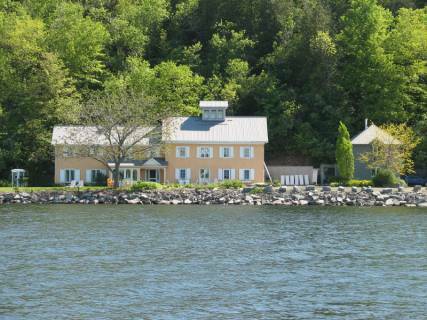 While we were in Picton, our dear friend Ann Gordon invited us for dinner in her historic, modernized house next to the Glenora Ferry Docks. 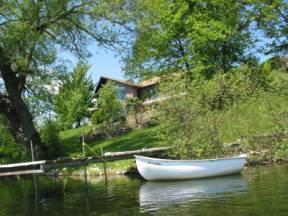 She lives in Stone Mills House, which was once home to John A. MacDonald, Canada’s first Prime Minister. 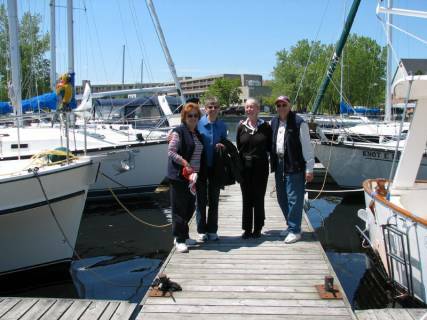 Ann also drove us back to Bellville to have lunch with Harry and Gwen Smith so that we could get some tips from them on going down the St. Lawrence River. 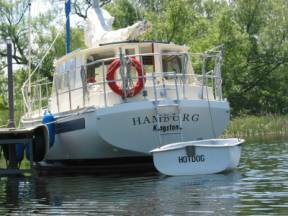 Harry, who has been Vice Commodore for Lake Ontario of the Great Lakes Cruising Club and Commander of the Toronto Power and Sail Squadron (a few years before Brian held that position) also saved Main Duck Island in the eastern end of Lake Ontario. In the mid-1940’s Canada sold the island to John Foster Dulles, the US Secretary of State from 1953 until 1959. There was no customs check-in on the island, just a lighthouse and keeper, so Dullas and friends would fly or sail to Main Duck and hunt deer out of season. When this was called to the attention of the Canadian government, they made the lighthouse keeper a customs agent to ensure “homeland security” was not breeched. 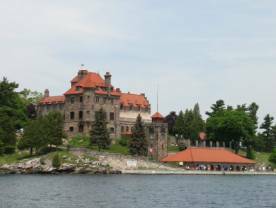 When Dullas died in 1959, his private pilot, a Canadian naturalized to US citizen, bought the island from the Dullas estate. Hart smeared the docks with creosote so that boats could not use them, even if seeking refuge from a storm. In the late 1970’s Harry Smith organized a “Save Main Duck” campaign. 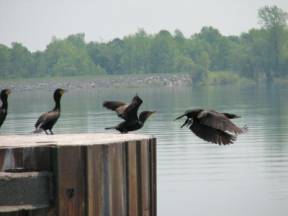 The Canadian government succumbed to the pressure and bought the island from Hart declaring it a nature preserve and a safe haven for boaters. 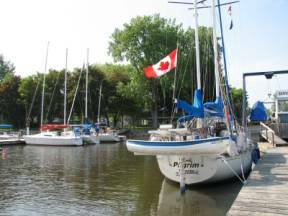 We left Picton and sailed to the Northeast tip of Prince Edward County to Prinyer’s Cove, a lovely anchorage with cottages dotting the shoreline and a number of boats on docks and moorings. 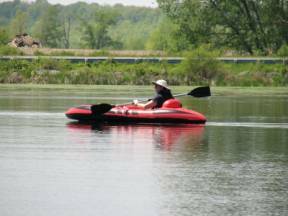 We spent a delightful, productive day in the cove; Brian caught 3 more Northern Pike, and Jane inflated her kayak and explored the shoreline. 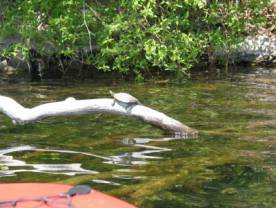 In addition to the fish, there were dozens of snapping turtles sunning themselves on logs and mooring tires. 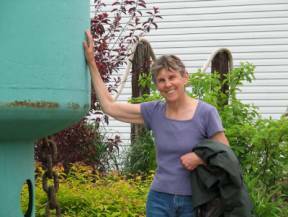 Friday, May 26 we motored to Kingston in the rain, did some re-provisioning and filled our watertanks. 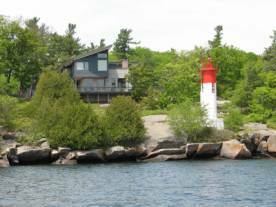 Saturday, May 27 we motored about 2/3 of the way through the 1000 Islands and anchored in the Navy Group, just west of Ivy Lea. Here we saw 6 magnificent red-tailed hawks. 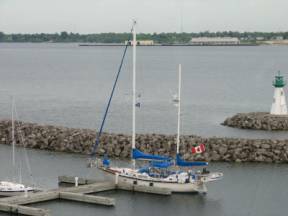 Sunday, May 28 we motored through the Canadian Middle Channel (for pleasure craft) to Brockville. The channel took us through some narrow cuts, beautiful islands with many cottages, some spectacular and castle-like, some more humble. 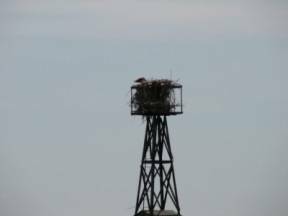 Once we joined the main shipping channel we saw our first ospreys and their nests on the buoy towers. 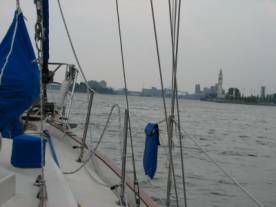 Once past Brockville, we hoisted our mainsail and coasted downstream for 11 miles to Prescott. The marina is Prescott was home to small bass, a Great Blue Heron (who was most interested in our stern line), and a Loon! 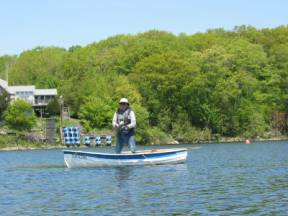 Monday, May 29 was another motoring day from Prescott to an island south of Cornwall. 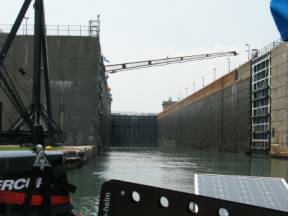 We went through the first 3 of 7 locks in this section of the seaway. The scenery is dull. We think when humans build dams to provide the even-increasing demand for energy, the beautiful river floods once productive lands and creates very shallow lakes with islands and one deeply dredged channel for commercial craft. 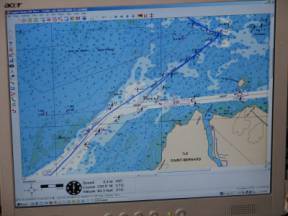 The result may make commercial sense, but it is still provides a pretty dull boat trip. 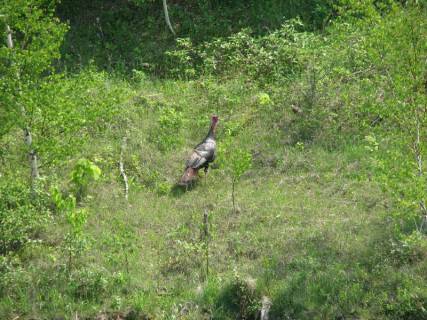 The highlight of the day was when a wild turkey flew across our bow while we were motoring between the to US locks. Our bird guide indicates this latitude is north of its normal range. 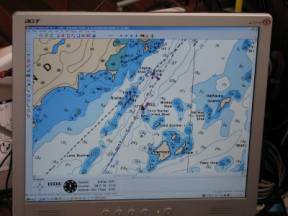 We anchored just south of St. Regis Island, a first nations reserve. 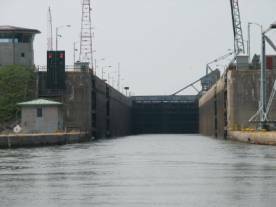 Tuesday, May 30 we continued motoring through the seaway, crossing Lake St. Francis and transversing the Beauharnois Canal, which has two lift bridges and two locks (each giving us a 42 feet drop). We have been amazed at the amount of debris on the water: branches, twigs, green and dried leaves and the inevitable seaweed the boats churn up with their propellers. 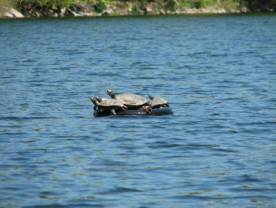 We were not surprised with the debris last summer during July and August in the St. Mary’s River, but this is still very early in the season. What is it like in August? The Beauharnois Canal empties into Lac St. Louis, another lake made from dam. We carefully made our way along the main shipping channel until we came to the cutoff for the north shore yacht clubs, then took a most circuitous route (the channel scribed a “Z”) to get to the Royal St. Laurent Yacht Club, where we were offered warm hospitality and a secure dock for the night.